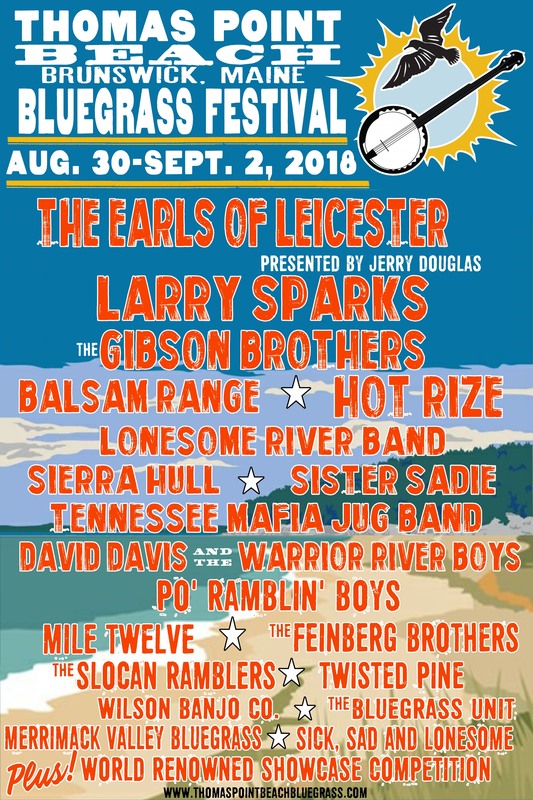 We can’t wait to see you at the Thomas Point Beach Bluegrass Festival! We strive to deliver one of the best Bluegrass experiences in the industry, all we ask for is your cooperation in observing the following important policies and guidelines to help us make that possible. WRISTICKETS MUST BE KEPT VISIBLE AT ALL TIMES. THIS INCLUDES DOGS. Do NOT remove or stretch! DOGS MUST BE KEPT AT THE CAMPSITE. NO Dogs are allowed in the Seating area, vendor area, playground, Main Lodge or Beachfront. Please be sure to clean up after. OPEN DISPLAY of ALCOHOL in the stage and other public areas area is not tolerated. Proper Behavior is expected at all times on the property. DISORDERLY BEHAVIOR is NEVER TOLERATED. SMOKING is NOT permitted in the seating area and courtesy for others is always requested. DANCING is welcome around the perimeter of the seating area, as to not obstruct the audience. PLEASE keep conversations in the stage area to a minimum to respect those enjoying the music. DRUGS ARE ILLEGAL and WILL NOT BE TOLERATED. PLEASE DO NOT ROPE OFF CAMPING AREAS. Camping is on a “First Come, First Served” Basis …Only exception…Reserved, Prepaid Electric Sites. THE SPEED LIMIT THROUGHOUT THE PARK IS 5 MPH at all times. THE PLAYGROUND IS CLOSED AT 10:00 PM each day. Please observe “Parent Watch” All Children 16 and under are to be with their Parents throughout the night. SKATEBOARDS, SKATES, SCOOTERS and ROLLERBLADES ARE NOT ALLOWED ANYWHERE IN THE PARK. FIRES ARE RESTRICTED TO FIRE RINGS OR FIREPLACES ONLY! No open / unconstrained or over-sized (higher than one foot) fires. SWIMMING is ALLOWED ONLY AT YOUR OWN RISK! NO LIFEGUARD on duty at any time! TRASH POLICY “Take IN, Take OUT”—Garbage bags are provided for your use. Please take your trash home with you. If you prefer not to…Please leave your trash by the roadside for daily pick-up. “Reduce, Reuse, Recycle” Do NOT Litter. THANK YOU !! NO PRIVATE SOUND SYSTEMS in the Stage Area. Private Systems among the campers MUST be kept at a MODERATE Volume. NO Exceptions. RV GENERATORS MAY NOTBE USED BETWEEN 10 PM -8 AM. ALL ROADWAYS MUST BE KEPT CLEAR throughout the Park. VIDEO CAMERAS ARE NOT allowed among the seated audience, PLEASE! No selling of any products without prior approval. No ground gray water disposal and, please, no Black Water disposal in Port-A-Johns! Please DO NOT USE HIGH-BACKED CHAIRS in the seating area. Be considerate of those behind you…Feel free to let others use your chairs while you are away. We ask that everyone exercise care and caution while inside the Park, as there are many children at play throughout. Please reach out to us with any issues as they occur —we can’t address what we don’t know about! Feel free to grab any Staff member for assistance. 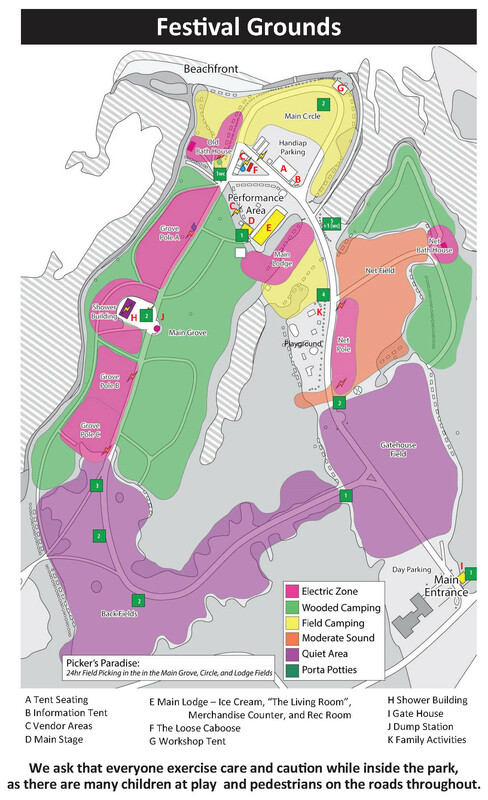 Quiet Consideration Hours are Observed from Midnight until 6:00 AM (with the exception of the Stage, Main Camping Grove, and Beachfront Area). Pickers are asked to be considerate so that others can rest. We appreciate your cooperation to all of the above and we hope you have a wonderful weekend with us at beautiful Thomas Point! WE RESERVE THE RIGHT TO REFUSE ADMITTANCE AND / OR TO ASK ANY INDIVIDUAL OR INDIVIDUALS TO VACATE THE PARK GROUNDS SHOULD VIOLATION OF ANY OF THE ABOVE POLICIES OCCUR.